Price - Crème Brûlée McFlurry - $1.69CAD (~1.65USD) + 13% VAT. I have been travelling constantly for the previous three weeks, and though I promised to keep the blog upto date and keeping on schedule with 2 posts a week, I know I have been a little slower than expected, but now that I am back in Korea I have a nice backlog of new updates to post for everyone. I was in my home town of Windsor Ontario Canada, just before Christmas, and I insisted to my mother that we had to stop into McDonald's before it became January, because they change their promotional items at the beginning of the month. 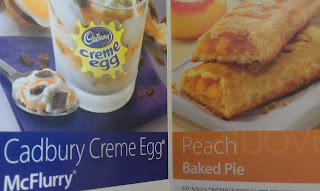 I didn't want to miss out on an item like the last time I was home, when I missed out on the Peach Pie and the Cadbury Creme Egg McFlurry (see photo at the bottom of the page). My girlfriend who had just flown into Canada 2 days prior wanted a coffee, and McDonald's Canada has a great deal for coffee. 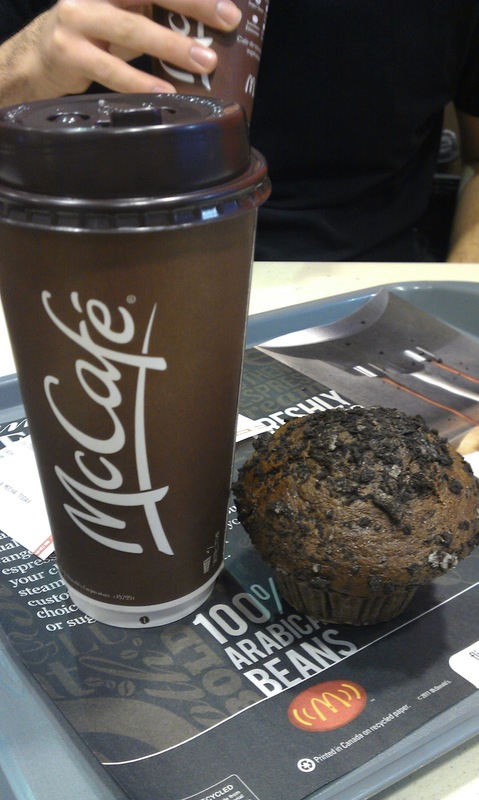 You can get a small coffee and any muffin for $1.39CAD, or a massive large coffee and muffin for $1.79CAD. 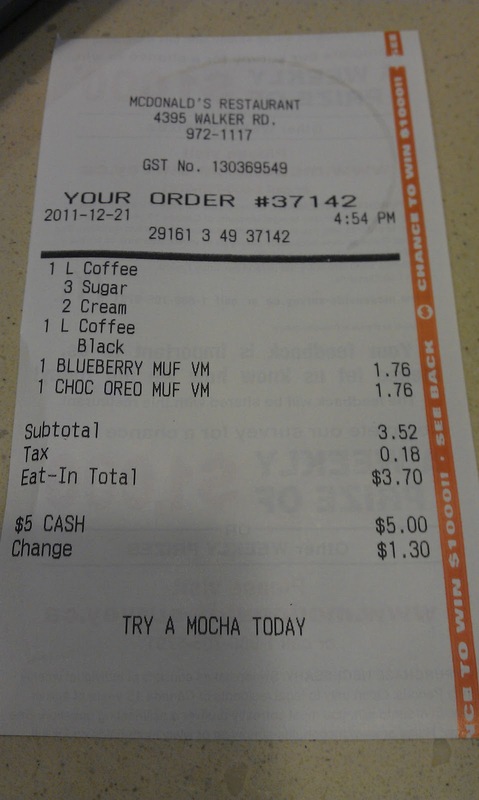 It works out that you get the muffin for only 17 cents more than the cost of the coffee. 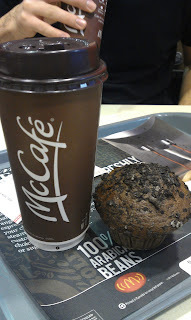 I tried the Double Chocolate with Oreo Crumble Muffin a few days earlier when I stopped with my friend Marc, so this time, I tried the Cranberry Orange Muffin and my sister had the Carrot Muffin. 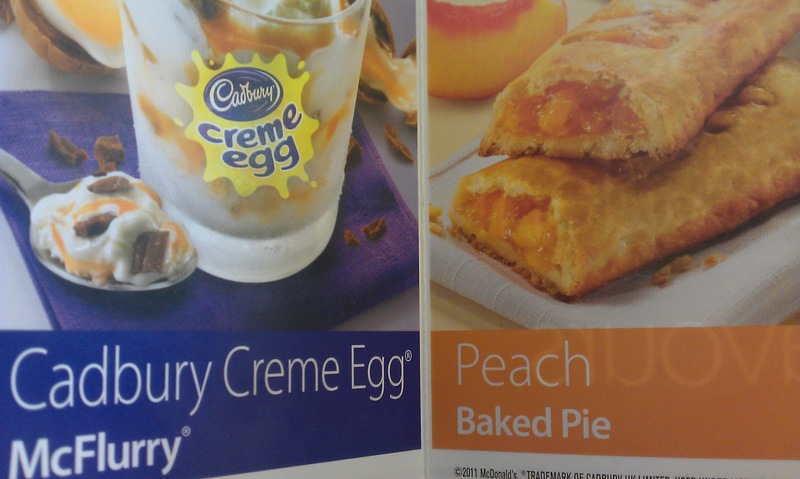 Other available flavours are Blueberry, Bran and Fruit & Fibre. McDonald's Muffins are moist and actually very good, but at 400-450 calories a piece, you might want to give them a skip even if they are only 17 cents with your coffee. Being a big chocoholic, I enjoyed the Chocolate one the most, but surprisingly the Cranberry Orange one was very good as well. I didn't really like the Carrot, but my sister and girlfriend did. The only other special item I saw on the menu was the Crème Brûlée McFlurry, so I ordered that as well. But it was shockingly terrible. It was a standard McFlurry with the caramel sundae sauce covered with some unidentifiable crispy bits. The 'burnt' bits which was supposed to represent the crispy Crème Brûlée top, were horrible little bits of something I could never figure out, some were so hard I felt I might break a filling. My girlfriend gave it a try as well, and she hated it too. Had a few bites and threw the rest away.